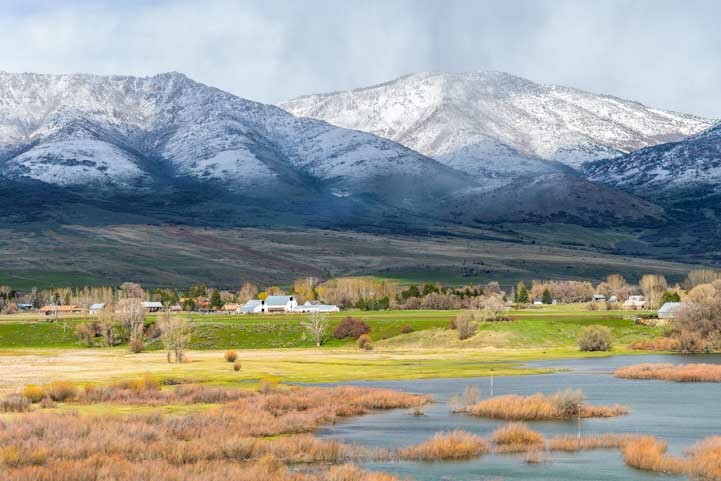 April 2018 – We have been enjoying an RV travel theme of rivers and lakes since we first camped on the beach at Sand Hollow State Park in Utah six months ago. Over the winter we explored Arizona’s Salt River, Lake Pleasant, Canyon Lake, Lake Havasu, the shores of the Colorado River. In early Spring, as we traveled north, we stopped by Lake Mead and Gunlock State Park and then frozen Strawberry Reservoir in Utah. Now, as we neared northern Utah, we were looking for a route around Salt Lake City that would avoid the traffic and high speeds of I-15. 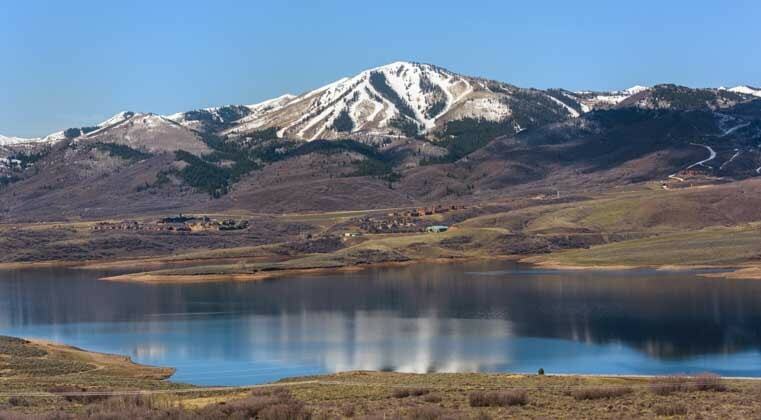 When we veered off to the east by Park City we got a fabulous view of Jordanelle Reservoir over our shoulders. Our first lake sighting on this leg of our journey: Jordanelle Reservoir, home of Jordanelle State Park. There is a state park campground there that we camped at years ago, but on this trip we slipped by and relished the view from a distance. 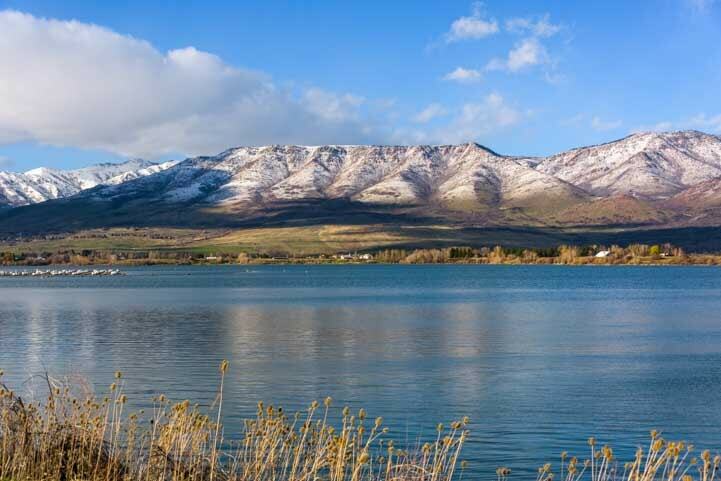 The 80 mile north-south stretch of greater Salt Lake City from Provo in the south through the heart of Salt Lake City and on to Ogden in the north is bounded on the east side by towering mountains and on the west by the Great Salt Lake. This makes for a tight funnel of congestion, so we were delighted to find a back road route with almost no traffic to take us along the eastern side of these same mountains and skirt greater Salt Lake City all together. Life was so tranquil on this side of the mountains we’d never guess a huge metropolis lay on the other side of the snowy peaks! 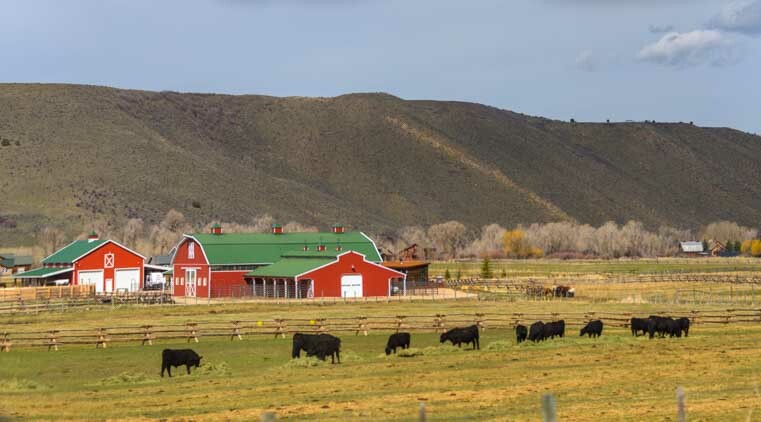 In this peaceful farmland it’s hard to believe we’re just outside Salt Lake City. 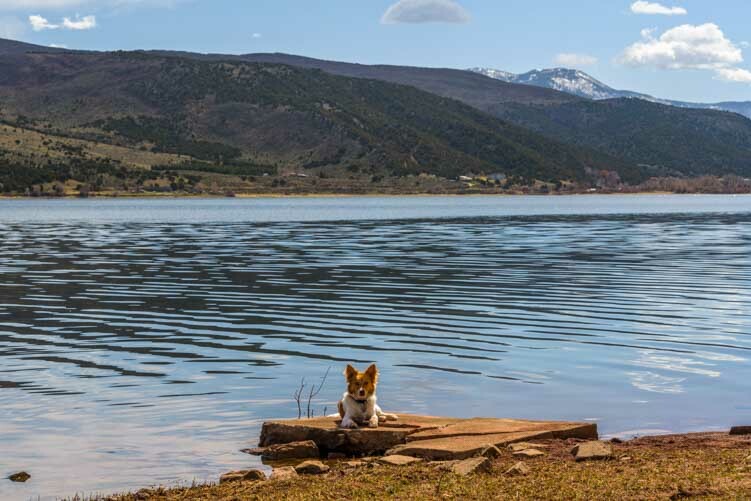 Our first stop at the shore of a lake was at Rockport Reservoir, home of Rockport State Park. We romped around at a few overlooks and beaches on the western shore and waved to the state park on the far side. Rockport Reservoir, home of Rockport State Park. A little further north we found the town of Coalville which has a fantastic Union Pacific Rails to Trails path that runs alongside the Echo Reservoir. 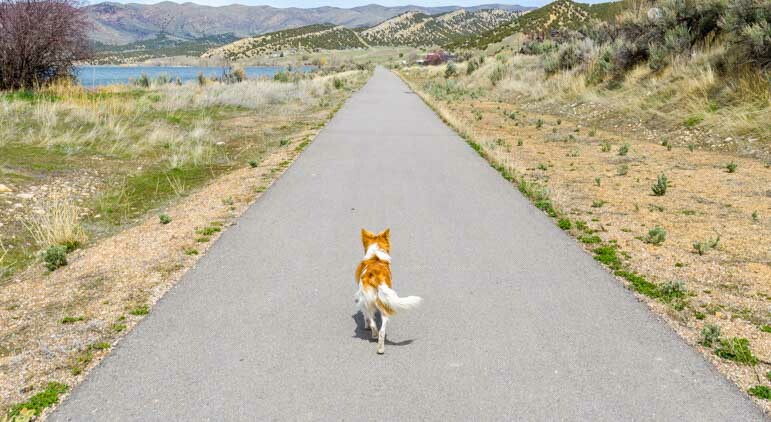 The Union Pacific Rail Trail runs from Park City past Coalville to the Echo Reservoir. 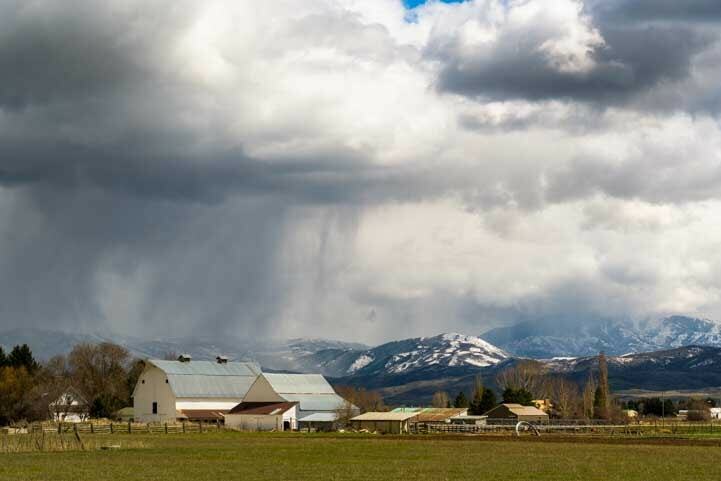 The weather began to deteriorate as we continued north, making for some wonderful drama in the skies above the farmland. 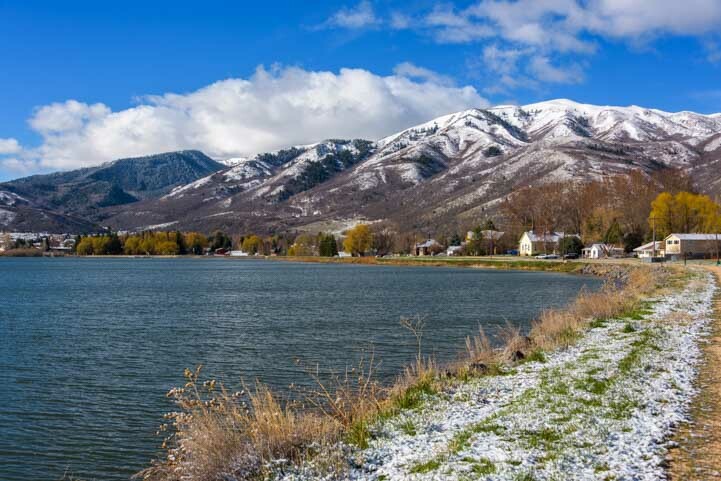 We arrived at Pineview Reservoir to find the sun playing with its shadows across the the mountains and the farm houses on the far shore. 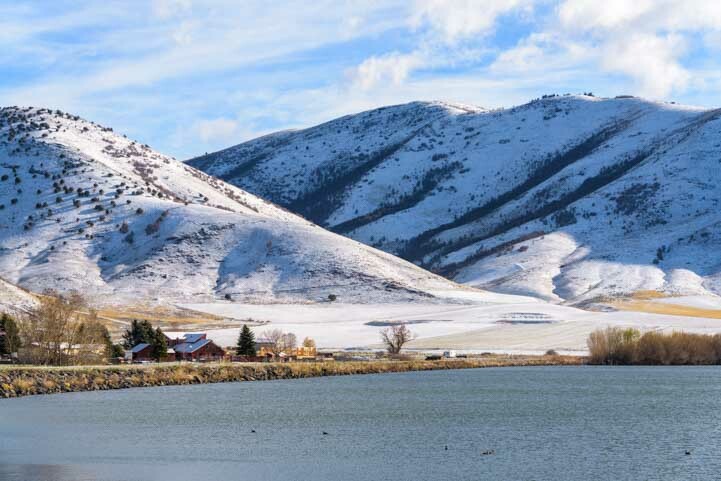 Pineview Reservoir after a dusting of snow in the mountains. 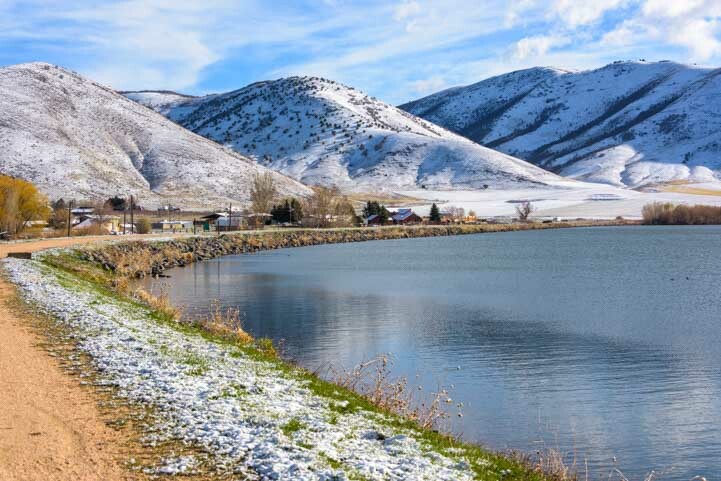 A few miles north of Pineview Reservoir is the town of Eden, aptly named for its truly picturesque spot in a valley between three tall mountains that are now home to ski resorts. This has brought a trendiness and cuteness to the village that wa evident on every corner. 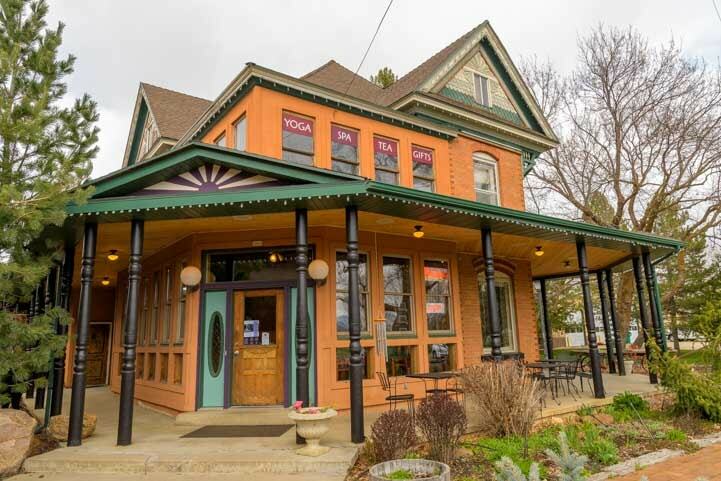 Yoga – Spa – Tea – Espresso – Gifts, all in a beautiful Victorian house. 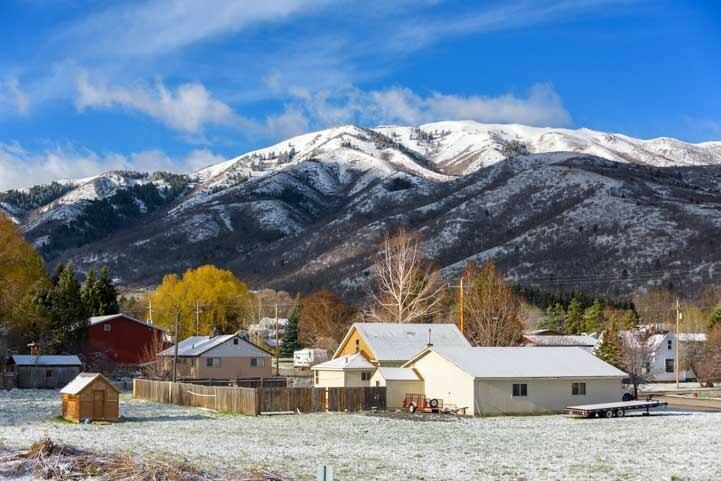 Nearby ski resorts give the pastoral area around Eden a trendy vibe. 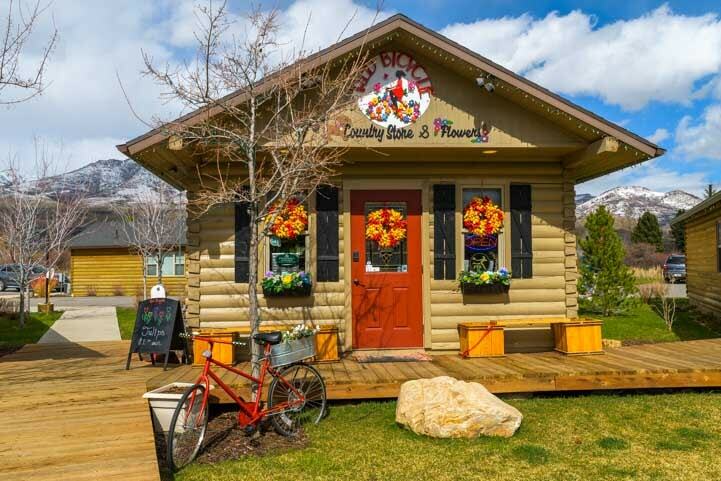 A circle of log cabins joined by a boardwalk has a cute boutique store in each one. 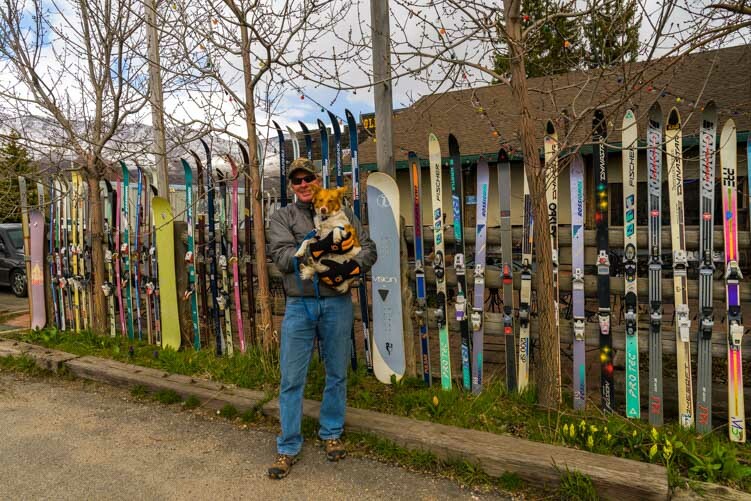 Behind the combination General Store and Mexican Cantina a fence around the outdoor eating area was made of snow skis, lest anyone forget that this area is a winter skiing paradise when they’re hanging out over beers in the summer sun. Despite the chill in the air, Spring was doing its best to get underway. 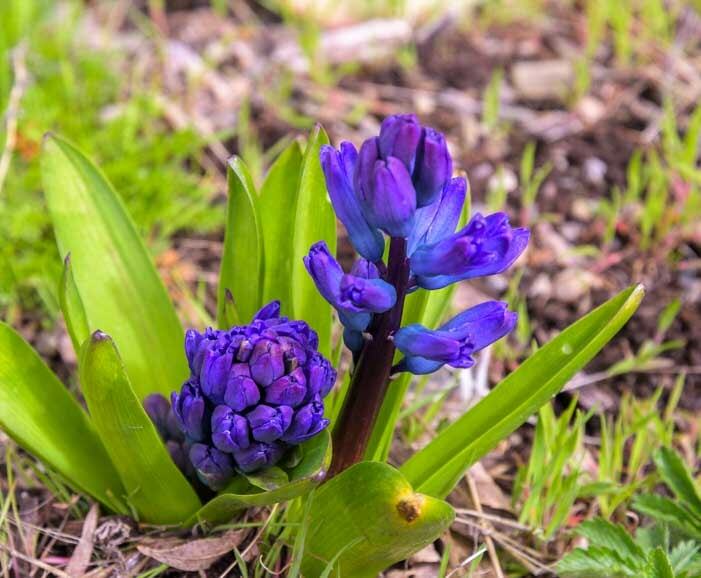 In one garden beautiful hyacinths were beginning to blossom, and a robin was making the rounds looking for worms. 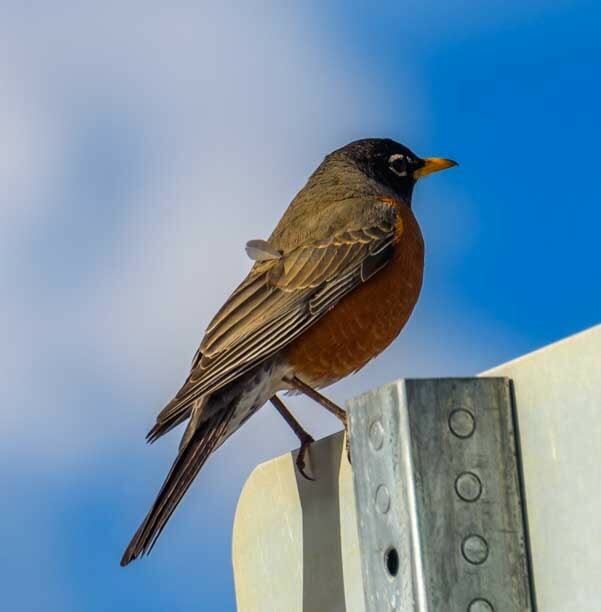 A robin reminds us that any snowfall we get should be pretty much the last of the season! But Spring was playing hide-and-seek with Winter, and one morning we woke up to snow. 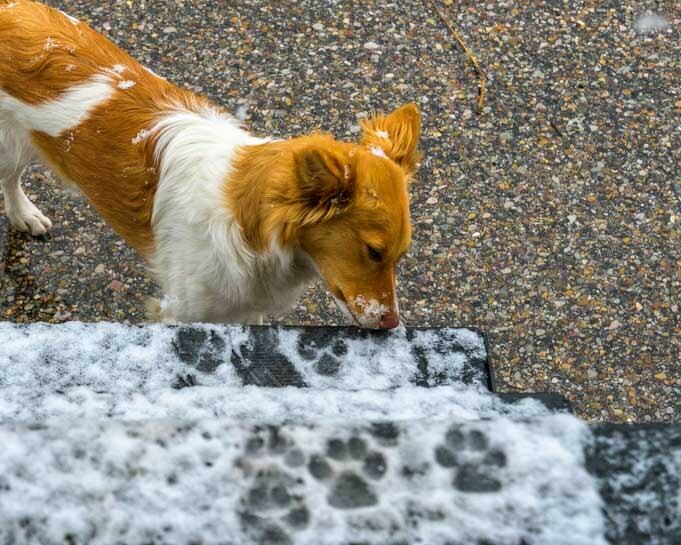 It melted quickly on the ground but hung out long enough on our RV stairs for Buddy to make some paw prints and get a taste of snow. Snow on our trailer’s steps capture some paw prints from our furry friend. 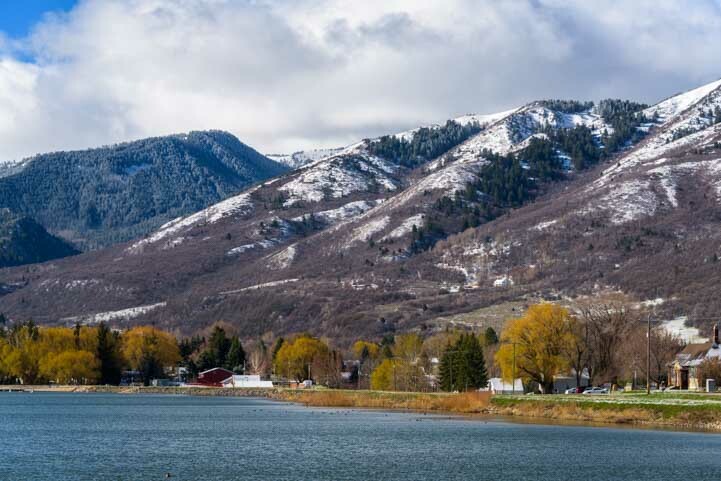 Then the skies cleared, and the dusting of snow on the mountains flanking Pineview Reservoir began to light up. 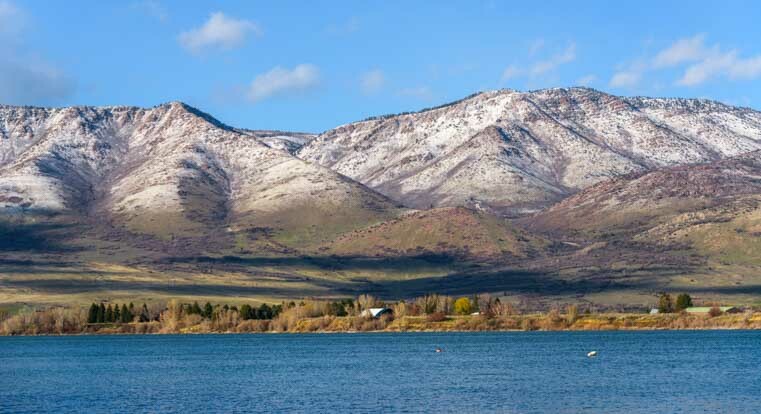 Pineview Reservoir reflects the mountains after the snowstorm. 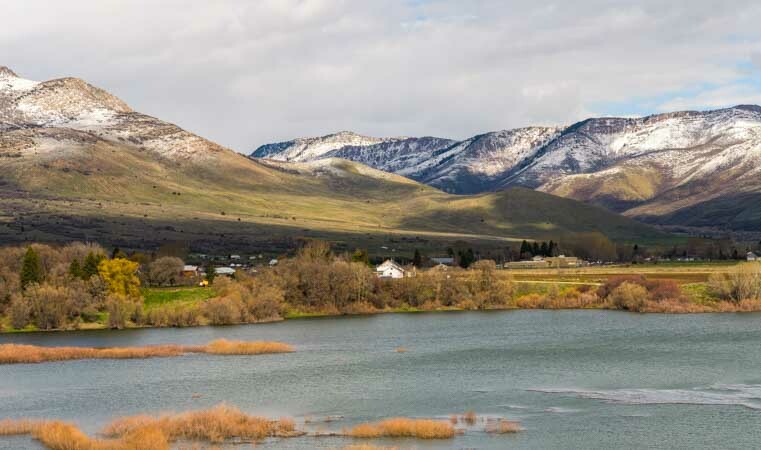 As we continued north, following a meandering path, on two occasions our back roads RV trip took us over the mountains separating the Salt Lake and Ogden area from this bucolic wonderland. Fog and brightly lit low clouds hung in the valleys between the mountains as we crossed over in the morning. Clouds and fog light up in the morning sun. We had gotten a very early start, and when we arrived in the village of Mantua it was a winter wonderland worthy of a Christmas card. The village of Mantua was enchanting. The town sits on the western shore of the small Mantua Reservoir, and we were delighted to find that there is a wide path that goes along its edge. An inviting path led us partway around the lake. As we walked along the path the views ahead of us were just spectacular. 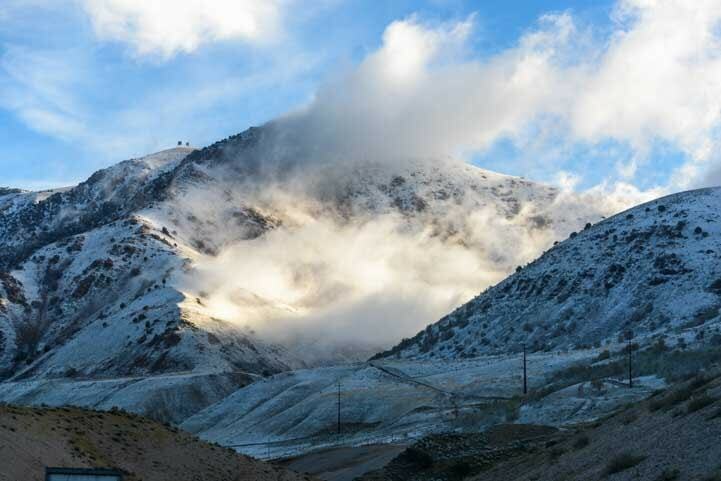 How glorious to arrive on the morning after a Spring snowfall. Horses ambled across a frosted pasture. What a pretty scene! 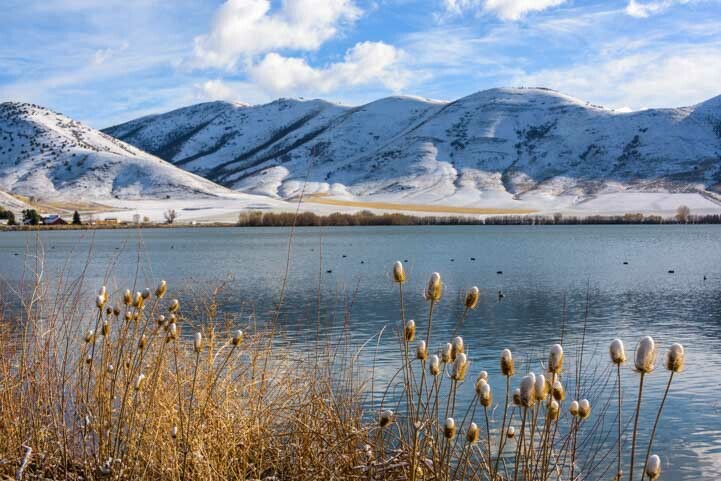 We had never heard of any of the towns or lakes on this back country route, but this particular morning in Mantua, strolling leisurely along the banks of the Mantua Reservoir, we felt like we were strolling through the pages of a picture book. A trail wanders up between the mountains. We made our way back to the village and were mesmerized by the quaint views going in that direction too. Reminders of last Fall’s golden colors complemented the white snow and blue water. 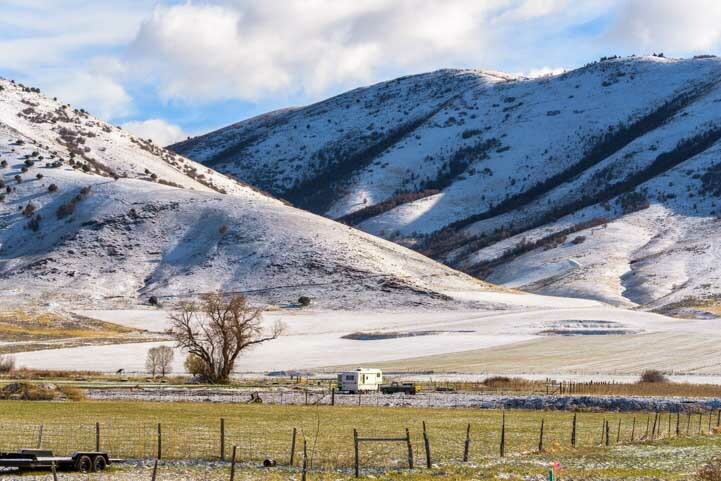 As we’ve often said, getting off the Interstate and staying off it is our favorite way to travel with our RV. Some of these roads looked really small on the map, but once we were on them, the driving was easy and the scenery was eye-popping. 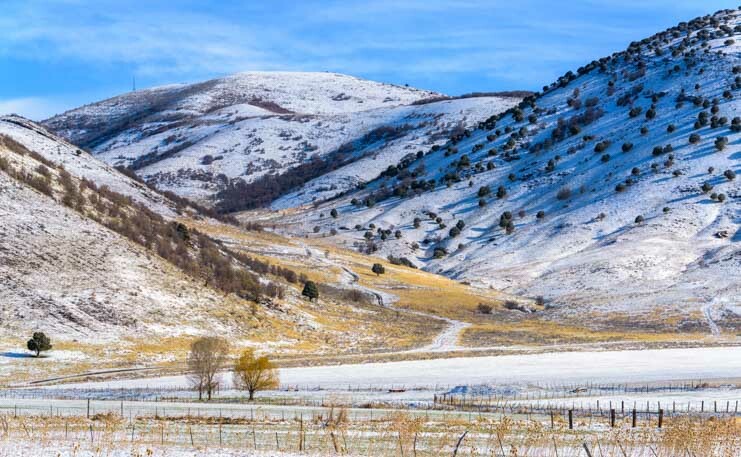 This entry was posted in Utah and tagged Back Roads RV Trips, New, Travel, USA, Utah, Utah Northern, WP Travel by Roads Less Traveled. Bookmark the permalink. Beautiful pictures as always from you guys! 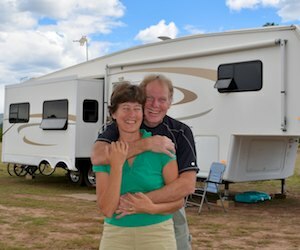 If you’re like me, you subscribe to all kinds of blogs from the RV world. I get notifications from so many that at times, I feel the need to “cull the herd,” so to speak. Not from you, though. Your photos, taken in places that we’ve sometimes been to, make me wonder what I was looking at while we were there! Thanks for your dedication! You are welcome, David. Thank you for your very high compliments!! We love taking photos and try to bring out the beauty we see (Mark is outside right now with Buddy in a very wonderful 35 degree foggy mist — I needed a hot cup of coffee first!). We really appreciate remaining on your list of favorite blogs, even after you culled the herd. Thank you for following us!! What an absolute pleasure it is to be able to ride along with you and Mark as you explore our beautiful country. I am finding it very hard to express just how much I enjoy reading about your travels and viewing the excellent photos. I try to soak it in. God willing, my wife and I will get to experience a bit of this adventure on our own in the near future. If not, we have ridden along with the best possible host and hostess who share unselfishly as they live their dreams. How wonderful it is! Thank you! Wow!! Thank you, Jeff, for being a part of our adventure. It is such a great pleasure to bring our various experiences to folks like you who haven’t yet had a chance to see the wondrous things we see and who value our efforts so highly. I hope you and Rhonda are able to do some adventuring very soon too, but in the meantime it makes us both feel really good to know that we inspire you and bring some moments of joy into your life! What a kind response. From now on I will just copy and paste the above comments😉! I don’t know that I can express our appreciation any better without it getting weird (said with a chuckle). As far as our adventures go, we are heading to Alaska this summer. We took our first trip up there in 2005 and this will be the 9th visit. We really love it and the countdown is on. I will try to send you a picture or two from the great north. Cutting and pasting works for me, Jeff! Have a blast in Alaska. Nine trips!! We have yet to go there, but it’s on the top of our bucket list!!! …”off the beaten track” sums it up ! Especially loved “Clouds and fog light up the morning sun”….other-worldly !!!! It is so much fun to explore the smaller roads that lead to who knows where. There are several cuts that go between the busy Salt Lake side and the pastoral rural side of these mountains, and we caught the morning light at just the right moment with the fog wafting between the peaks and the sun shining through…it was a lucky shot through the windshield (with a puppy in my lap!)!! I just love those pictures!! I’m surprised to hear myself say this after our long NE Ohio winter, but you can make snow look really pretty!! Our Edge Tuner (left) and Air Intake System (right) have made a huge difference in our truck's POWER and MPG! More info: Edge Tuner Truck Upgrade. A hand vacuum is all we use (our 20 year old Dust Buster may get replaced by this nice Eureka!). I sweep our kitchen out with a dust broom every day. Not as fun as sightseeing, but ya gotta do it! Find more RV cleaning ideas in our Gear Store!